Figure: Schematic circuit diagram of FabFTDI. The FabFTDI is powered through USB port which provides 500mA at 5V. The USB controller needs a precise clock, therefore, an external 16MHz resonator is used as a precise clock source (note- eventhough the resonator is not as precise as a crystal, its precision is sufficient for a USB 2.0 full speed device). The FabFTDI is a USB 2.0 Full-speed device and support upto 38400bps of serial communication. The Unix and Mac OS doesn not require any drivers, however, a driver is required for windows operating system (more on this later). Figure below shows the FabFTDI board design. Figure: Board design of FabFTDI. Figure below shows the milled board. Inspect for error and make sure no wires are short-circuiting. 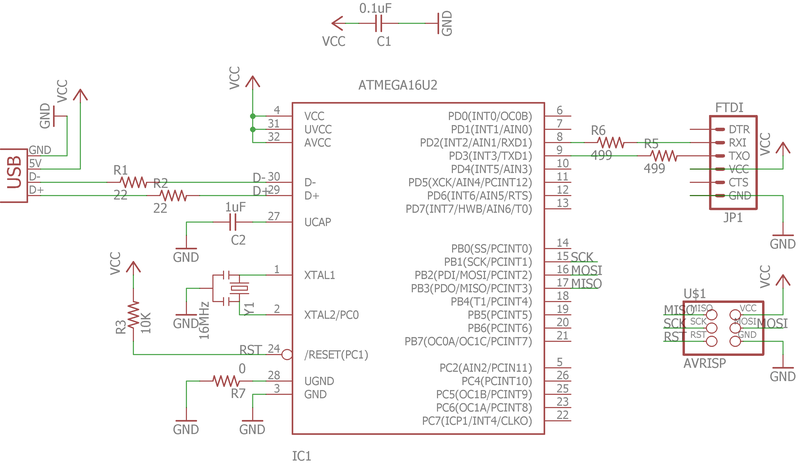 Atmega16U2 micro-controller (or a compatible micro-controller such ast Atmega8U2 or Atmega32U2 with same pin count). One 0.1uF capacitor, and one 1.uF capacitor. One 0ohm resistor, two 22ohm resistors, two 499ohm resistors, and one 10K resistor. One 6 pin 2x3 connector (aka ISP connector), and one 6 pin 1x6 connector. It is recommended to start with stuffing smaller and difficult components first and then bigger and easy components such as connectors. 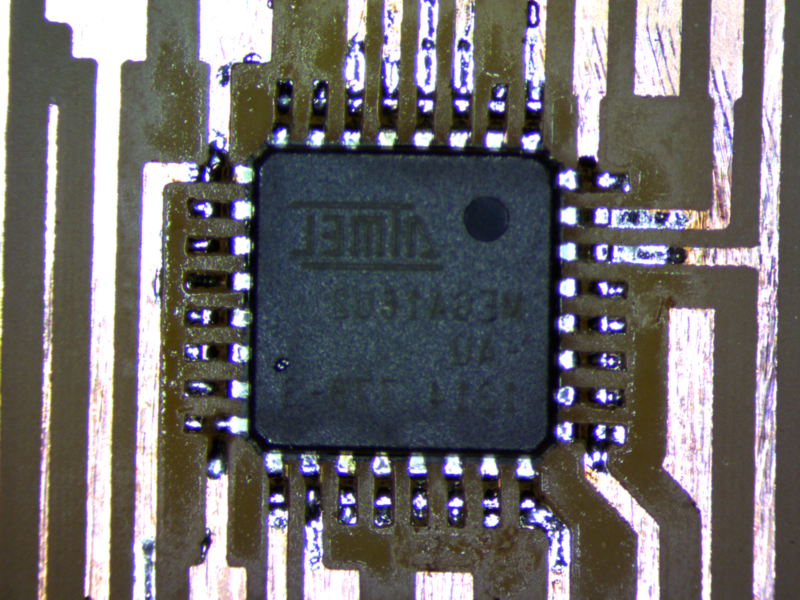 For FabFTDI, start with soldering the micro-controller as it is tricky since the pins are very close to each other. Here, I am showing an easy way to solder the microcontroller. First, carelessly solder all the pins to the pads and then use copper braid to remove excess solder. 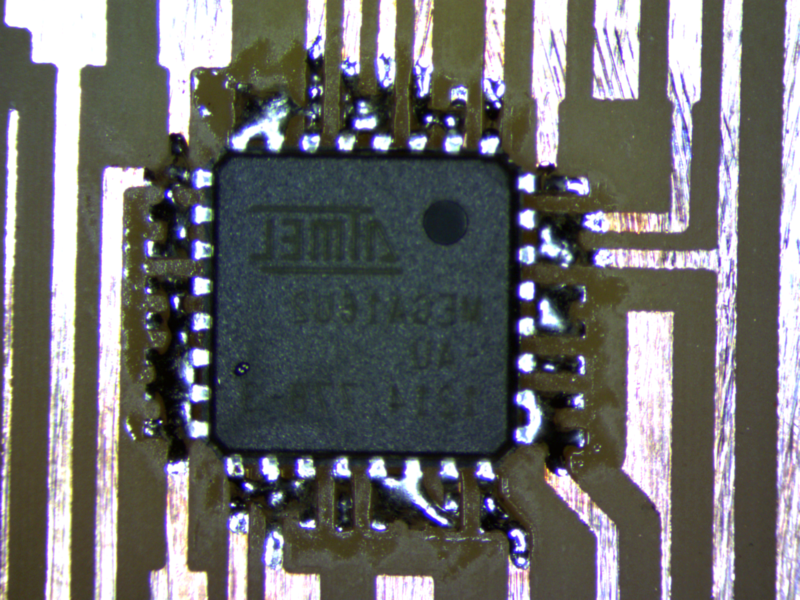 Once the micro-controller is soldered. Solder other components like resistors and capacitors. Finally, at last, solder ISP connector and FTDI connector. Figure below shows my stuffed board. Download the firmware file from here and extract it. Clean and remove the previously compiled files. Program the newly created hex file to your FabFTDI board. Once the program is succesfully flashed, disconnect the programmer and disconnect the FabFTDI from your computer. Now, connect the FabFTDI back again to your computer and this time the operating system should detect your bouard as FabFTDI. 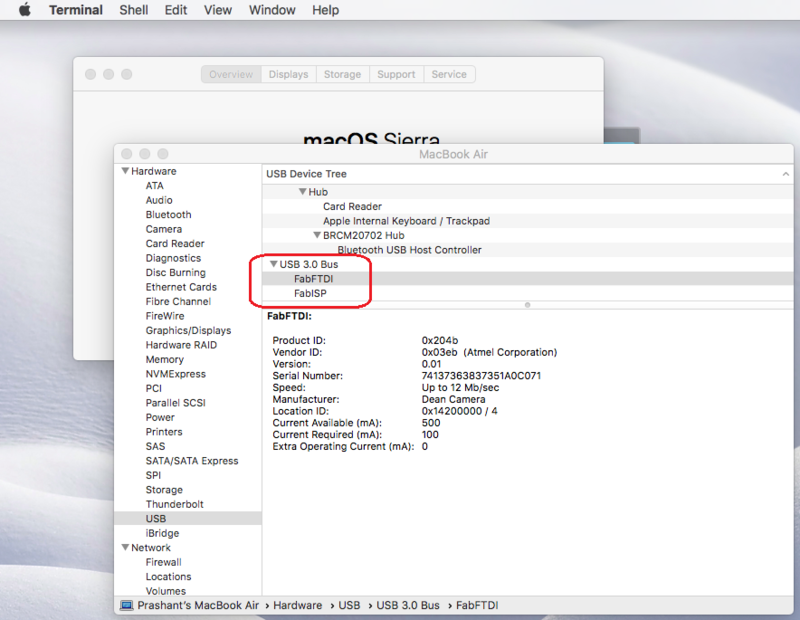 Next section describes how to check if your operating system can detect connected FabFTDI. Click on the apple icon on the top-left of the screen and then click on "About this Mac". A "system information" box will open, click on the "system report" button which will open another window. On the left of the window, scroll-down and click on USB. Here you should see FabFTDI listed. See the image below for reference. In the list of connected USB devices, you should see FabFTDI listed. Windows operating system need a driver for the FabFTDI to work. When you will connect the FabFTDI to your Windows PC, it will be registered as an "unrecognized device". Follow the instructios below to install the driver. Downlaod the driver (.inf file) from here. Open the device manager, right click on the "unrecognized device" and click on "update driver". Give the path to the downloaded .inf driver file and windows should be able to succesfully install the driver. Once the drive is succesfully installed, the FabFTDI should be listed as "LUFA USB to Serial" in windows device manager. Check the image below for reference. 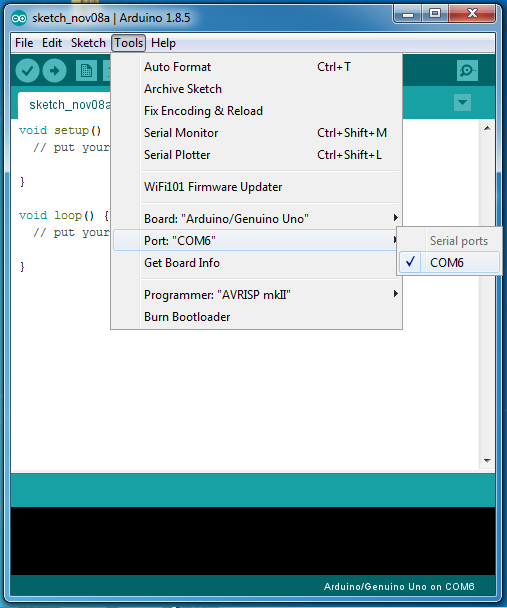 If you don't already have arduino, download and istall it. Now go to Tools and open "Serial Monitor". Connect the Rx and Tx pin of your FabFTDI board using a jumper wire (or a jumper, or just wrap a wire around Rx and Tx pin) as show below. Now go to "Tools" and open "Serial Monitor". In the Serial Monitor, the top text input box is for sending the character to the FabFTDI and the bottom "read only text box is showing the recieved characters. Since, we have connected the Rx and Tx pin. Any character send to the FabFTDI will be recieved back to FabFTD and should appear in the reciever text box. Type something on the top text box and click on "send". If you see the same characters show in the text box below, you have a working FabFTDI. Congratulations!! Consider using other USB port on your computer. Our FabFTDI is a USB 2.0 full speed device. Many modern computers come with USB 3.0 ports which technically should be compatible with USB 2.0, however, sometime connecting a USB 2.0 to a USB 3.0 port doesn't work. Check that you have used the right resonator. It must be 16MHz resonator.